I like to try new crops, to expand my knowledge of foods and to see what grows well in my area. 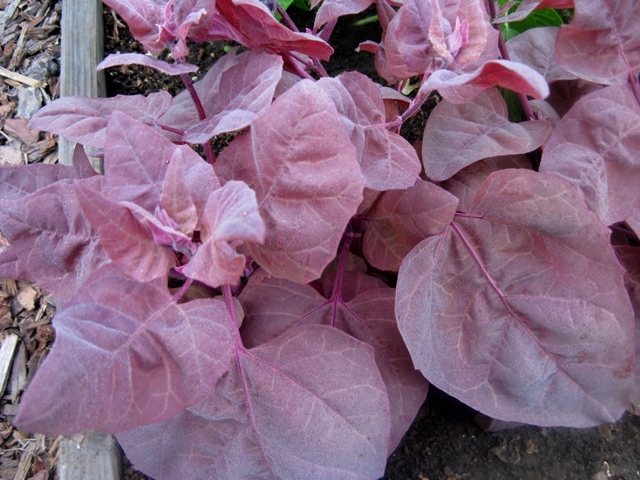 One of the vendors I buy seedlings from (Sunnyside Organic Seedlings) had something that looked interesting because of its beautiful purple leaves. They called it hillbilly spinach, but I’ve found it also is called mountain spinach, French spinach, red orach, purple orach and garden orach. Technically, it is Artiplex hortensis, in the Amaranthaceae family, making it a close relative of spinach, but it is not actually a spinach. Technical classification issues aside, I’ve found a winner. The plant is very productive, and produces large leaves that are easy to harvest and clean. The leaves would be good raw in a salad, contrasting nicely with green lettuce or arugula leaves. I steamed it and was delighted to find that it retained it’s purple color and tasted delicious. To top it off, so far I have had no major pest problems with this plant. While I’ve been out most nights the past several weeks with a flashlight looking for slugs and earwigs, those pests never bothered these plants. I will definitely be saving some of the seed from these plants and growing more next year, perhaps as an ornamental in my front yard. I bought your Hillbilly Spinach at the Healdsburg Nursery but I would like to know a little more about it. When I can harvest? Should I cut only the leaves or the all plant? or will be the same way other greens? I like both leaves and stems, as long as the stems are tender. So, when I harvested, I whacked off tall stalks filled with leaves, keeping for eating all the leaves and as much of the stems as were edible. Hope this helps.